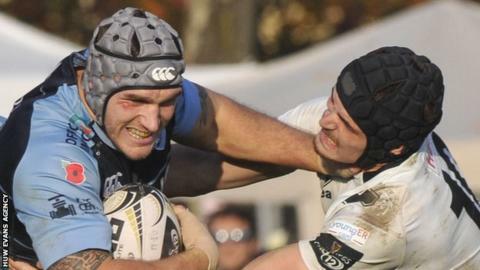 Zebre's Dries van Schalkwyk went over twice as Zebre earned a deserved bonus-point Pro12 win over Cardiff Blues. The Italian region produced some outstanding attacking play but spurned several second-half chances. Wing Kayle van Zyl crossed first, with Adam Thomas levelling for Blues before Van Schalkwyk scored his first try. Johan Meyer got Zebre's third before the break and, after a Tom James counter-attack finish gave Blues hope, Van Schalkwyk sealed the hosts' win. It was a fifth successive loss for Danny Wilson's Blues as Zebre gained revenge for their opening-round defeat in Cardiff. All of those Blues losses came away from Cardiff Arms Park, which was used as a 2015 World Cup fanzone while games took place in the Welsh capital. Fly-half Carlo Canna was central to attacking efforts that often left Blues defenders grasping for thin air. Canna's offload sent Van Zyl in at the corner and Thomas replied off fly-half Rhys Patchell's long pass. Matteo Pratichetti's counter-attack ended with Van Schalkwyk's first try and Meyer gathered Canna's chip over the visiting defence for a third home try within 28 minutes. Canna converted Van Schalkwyk's and Meyer's tries and Patchell kicked a penalty to leave Blues trailing by 11 points at the break. Patchell launched the length-of-the field counter-attack that ended with replacement scrum-half Lloyd Williams breaking clear before sending James away. Fly-half Patchell converted and Blues' hopes rose further when Andrea de Marchi was sin-binned in the 67th minute. But Van Schalkwyk rewarded the home side's efforts with the decisive try five minutes from the end and Canna added the extras. Zebre: Dion Berryman; Kayle Van Zyl, Giulio Bisegni, Matteo Pratichetti, Leonardo Sarto; Carlo Canna, Luke Burgess; Andrea Lovotti, Andrea Manici, Dario Chistolini, Quintin Geldenhuys, George Biagi (capt), Jean Cook, Johan Meyer, Andries Van Schalkwyk. Replacements: Oliviero Fabiani, Andrea De Marchi, Pietro Ceccarelli, Valerio Bernabò, Jacopo Sarto, Marcello Violi, Guglielmo Palazzani, Edoardo Padovani. Cardiff Blues: Dan Fish; Blaine Scully, Tom Isaacs, Adam Thomas, Tom James; Rhys Patchell, Tavis Knoyle; Sam Hobbs, Matthew Rees, Taufa'ao Filise, Lou Reed, James Down, Josh Turnbull, Ellis Jenkins, Josh Navidi (capt). Replacements: Ethan Lewis, Thomas Davies, Craig Mitchell, Macauley Cook, Manoa Vosawai, Lloyd Williams, Gareth Davies, Garyn Smith.